This was supposed to be cookies. I baked them again, Huey ate them again. I don’t want to talk about it. Yes, I am a fool. 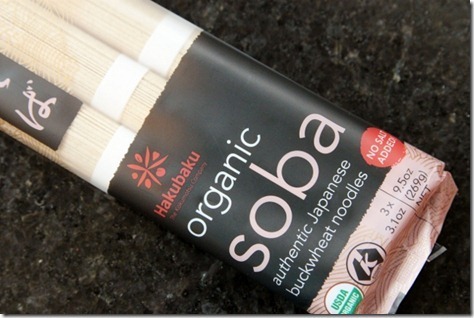 Moving right along to soba noodles! 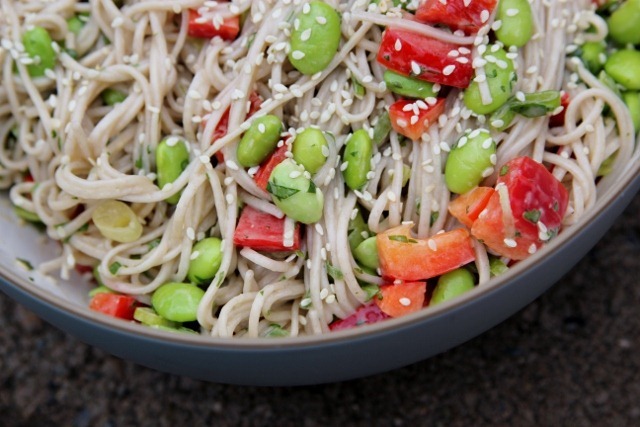 I have a major thing for cold noodle salads. 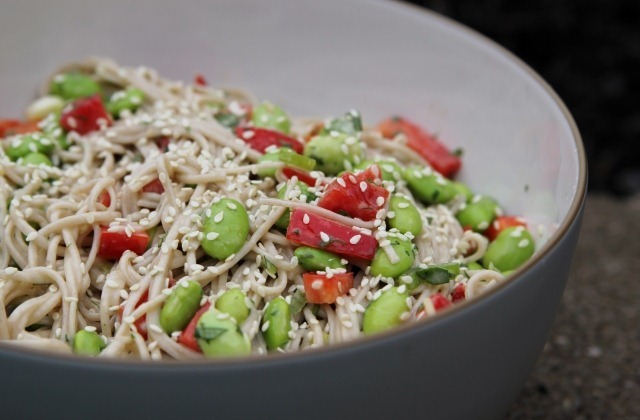 Whenever I get something from the prepared food counter at a store like PCC or Whole Foods, I always end up gravitating toward the Asian noodle salads. So when thinking about what to make for my moms group this week, I figured it was about time I make and share my own. 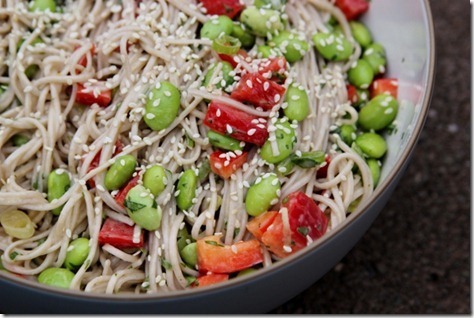 I love cooking with soba noodles because they are so easy to prepare and keep cold. They cook in just a few minutes, and the thin, chewy texture is unique and different from what you expect from Italian pasta. But before cooking the noodles, prepare all of the raw ingredients. Chop the bell pepper, thinly slice the green onion (or scallion), and mince the cilantro. Add veggies and herbs to a large mixing bowl. Prepare edamame according to package directions. If frozen, cook for a few minutes in warm water to bring up to room temperature. 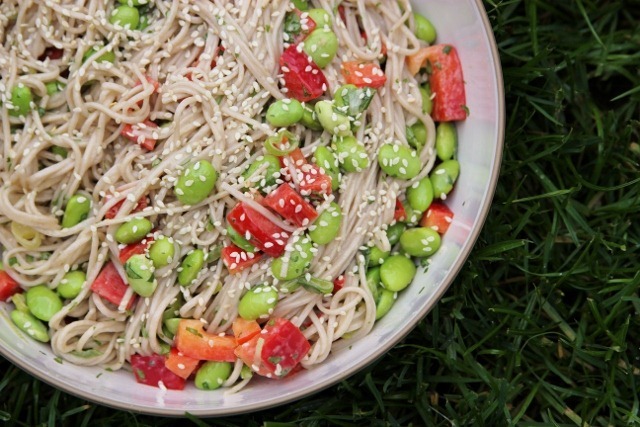 Make sure your edamame is shelled (no one likes to eat chewy pods!). One the veggies are all prepped, go ahead and cook the noodles. 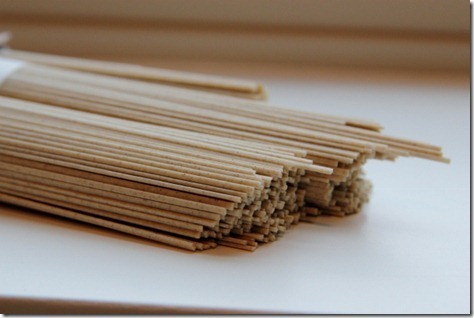 Soba noodles only cook for 4-5 minutes, so don’t wander too far. 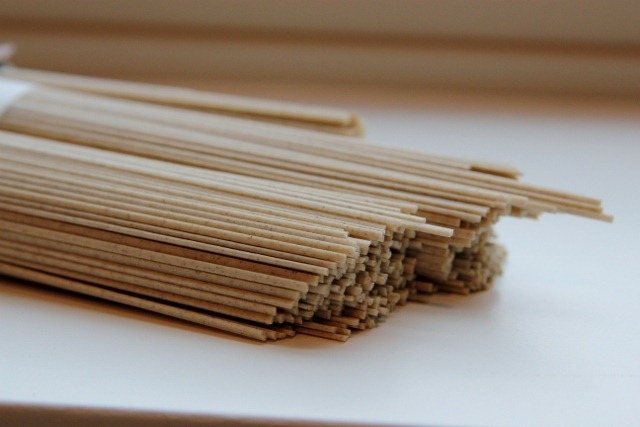 Once the noodles are cooked, drain in a colander and rinse with cold water immediately. In a separate bowl, whisk together all ingredients for the dressing. 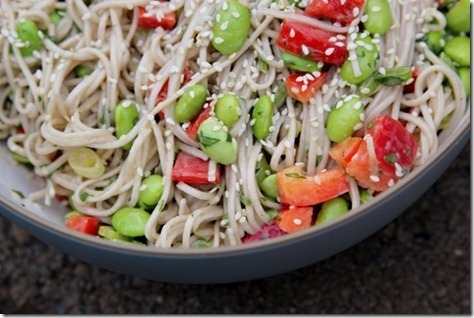 Combine noodles, veggies, and dressing in the mixing bowl and toss until everything is well combined. Sprinkle with sesame seeds to garnish, serve, and enjoy! This salad is great served immediately, or it can be prepared ahead of time and served cold from the refrigerator. 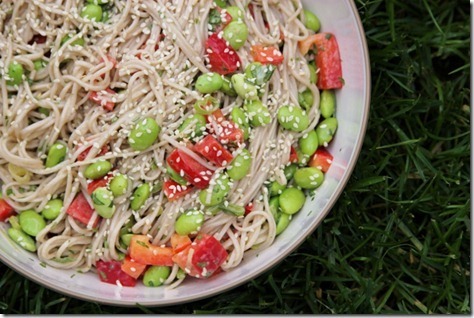 The edamame add a great healthy protein component that helps make this dish a complete meal! This was so easy and simple to make, and I’m making a point to stock soba noodles along with my other pantry goods from now on. It’s one of those dishes that feels fancy and fussy, but it actually came together in less than 15 minutes from start to finish. Great for quick, healthy dinners or for portioning out for lunches all week. Next Post » Special Delivery. Made this last night for dinner and it was absolutely delicious. And it was SO easy. I threw the frozen edamame into the boiling water for the soba noodles and it eliminated an extra pot to clean. I also added a squirt of Sriracha to the dressing. My husband has requested that this be a rotating item on our summer dinner menu. Can’t wait to try different veggie combinations as this is a really versatile base recipe. Thank you! I made this for dinner tonight and it was really great! I omitted the sesame oil (I couldn’t find it at my grocery store,) added more tahini and vinegar, and and subbed in a little EVOO instead. Delicious! Thanks for the great recipe–it was the first of yours that I made and I will be making more! I made this tonight and it was soooo good! I am already excited to have it for lunch tomorrow. Thanks for the great recipe Emily! Thanks for this recipe Emily! I made it for my birthday dinner along with some shitake mushrooms and baked ginger tofu. It was definitely a crowd pleaser! I just made this to “bring to a potluck” and I think I have to make another batch because I basically ate the whole thing on my own! So good! I searched your recipe page for cilantro and this was one of the options that popped up. 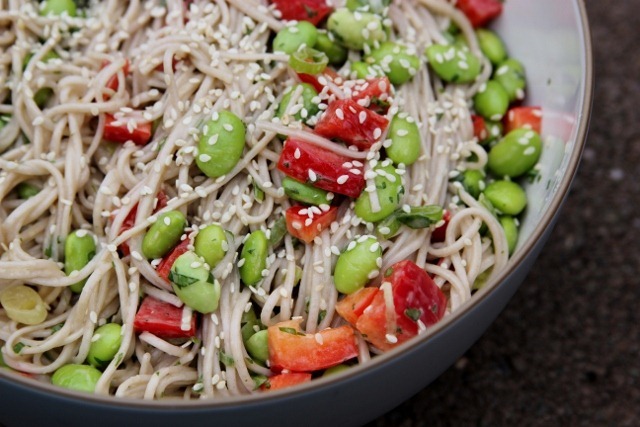 I actually had all the ingredients on hand except the soba noodles which I’ve never used. This was out of this world. I love making your recipes – they’re usually so simple and yet super delicious!